Get your 2017 KS1 Maths SAT papers here for free download. This new style of test has only been running for a short time so there are not a lot of relevant papers available in order to gain a good insight on what might come up this year. 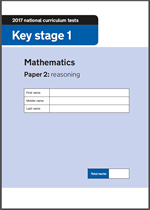 However, we do have a fantastic range of resources for both the Arithmetic and Reasoning papers to help your child practise the style of question found on the papers. Fractions, money and improving sentences all new this week. URBrainy © 2019. All Rights Reserved.